What's your all time greatest supercar? Classic and sports car magazine has opened a poll to find the world's greatest ever supercar. The survey is open to voters world-wide ahead of this year's Classic and Sports Car Show, which is to be held from 28-30 October in Alexandra Palace in London. Voters choose their favourite car from eleven decades of spectacular motors as chosen by the magazine, with the winning vehicle from each decade appearing at the show, together with an overall winner which will be announced live at the event. Obviously the list of suitable candidates from this era is smaller but nonetheless there are some amazing entries in the shortlist. They include the Mercedes 1908 GP, the Metallurgique Maybach and the Panhard et Levassor. At this point of time most people were still using horses and carts to travel around, with Henry Ford's mass production Model T having been on sale since 1908. From 1914-1929 the shortlist of entrants features the Mercedes Benz SSK, the Bugatti Type 43 and the Bentley 4.5 litre Blower. There wasn't a lot of cash around after the First World War but automotive technology had advanced dramatically by the end of the 1920s. Cars began to be a marker of wealth and social status, particularly the Mercedes, Bugatti and Bentley brands. 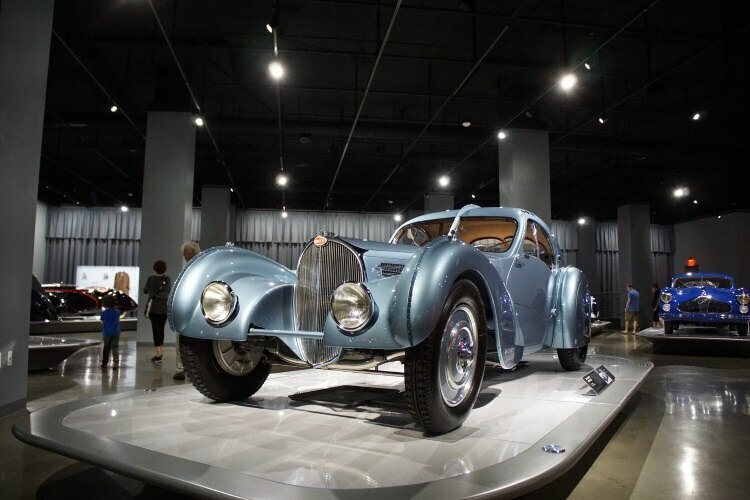 The Bugatti Type 57SC, the Alfa Romeo 8C 2900 and the Delahaye 135 Sport are the candidates for the 1930s, a turbulent decade featuring the Great Depression and the advent of the Second World War. However it was also a great period for motorsport and vehicle development. For the 1940s you can choose from the Ferrari 166 Barchetta, the Talbot-Lago Grand Sport and the Jaguar XK120. Once again automotive production was curbed by the Second World War, but this only made designers and engineers more inventive. Cars became faster and sleeker. The 1950s shortlist is made up of the Mercedes 300SL Gullwing, the Jaguar XKSS and the Ferrari 250GT SWB, a decade of growth, huge optimism and important cultural shifts. The jet age had begun, rock 'n' roll was shocking parents everywhere and the space race was on. This led to more futuristic vehicle design and great leaps in performance. The leading supercars of the 1970s include the Lamborghini Countach, the Porsche 911 Turbo and the Ferrari 365GT BB, showing that some people at least had taste in that notoriously ugly decade. The fuel crisis forced the development of energy-saving automotive technology such as the turbocharger. In the 1980s you can choose from the Porsche 959, the Ferrari F40 and the Ferrari 288GTO, all as bold and brash as the decade's over the top fashion and hairstyles. Supercars were on posters on many a teenager's bedroom walls. Candidates for the 1990s are the Bugatti EB110, the McLaren F1 and the Jaguar XJ220, all pushing the boundaries for top speed. This is when supercars began to get really quick and really, really expensive. Things got even faster and more spectacular in the 2000s, when the Pagani Zonda C12, the Bugatti Veyron and the Koenigsegg CCX pushed the 'supercar' tag even further - these were the first 'hypercars'. Power outputs exploded, noses got sharper and cars got lower to the ground. The 2010s features the familiar trio of the McLaren P1, the Porsche 918 Spyder and the Ferrari LaFerrari, marrying amazing performance with clean and green technology. Electric power is now helping manufacturers towards even higher top speeds but with a clean conscience.